Holy cow, would you just look at that thing up there? It's so obscenely ridiculous. What are you even trying to pull here cake? Really. Don't you know this is a blog for families? Stop it with your nonsense. If ever there was a recipe so easy and yet sodanggood, this would be it. The ratio of deliciousness to easiness is not to be taken lightly. Because it's really serious stuff. Or maybe it is to be taken only lightly. Whatever floats your boat. This cake, this mother load of yumminess, is one of those desserts that you literally grab pre-made elements, throw together in no time flat, place onto a platter, drizzle with tons and tons of chocolate sauce (can I get an amen on that one?) and call it a day. Your friends' heads will explode upon seeing this baby. They'll think you're a master of dessert making goodness. The Queen of all Cakes! The Betty Crocker of 2014! The Martha Stewart of their friend circle. Only you will know the real truth. 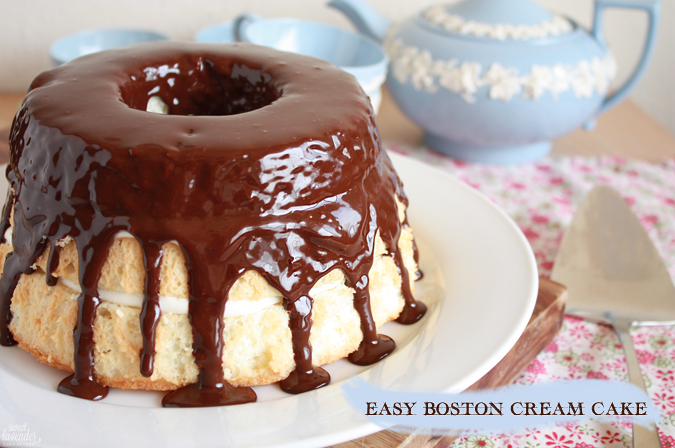 Get on this Boston Cream Cake, like yesterday. 1. Place chocolate chips or chunks into a heat proof bowl. 2. In a small sauce pot, gently warm up your cream until it is just about to boil. Do not boil. 3. Remove cream and pour over chocolate. Allow to sit a few minutes and then whisk together until smooth. 4. Set aside in fridge to cool, until needed to assemble cake. Stir every now and then. 1. Beat pudding mix and milk together in a bowl until thoroughly combined. Turn mixer up to medium high and beat another 2 minutes. Set pudding in fridge. 2. In another bowl or stand mixer fitted with a whisk attachment, beat together your heavy cream and powdered sugar until medium stiff peaks form. 3. Carefully fold whipped cream into pudding. Set back into fridge until needed. 1. 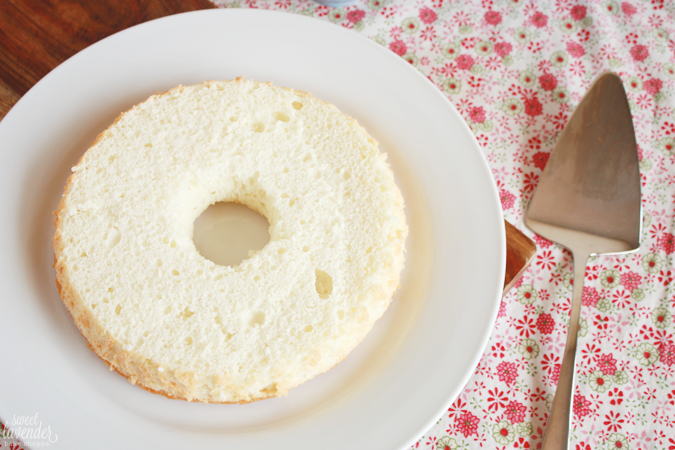 Remove angel food cake from package and set onto a cutting board. With a serrated knife, cut cake into 3 even horizontal layers. 2. 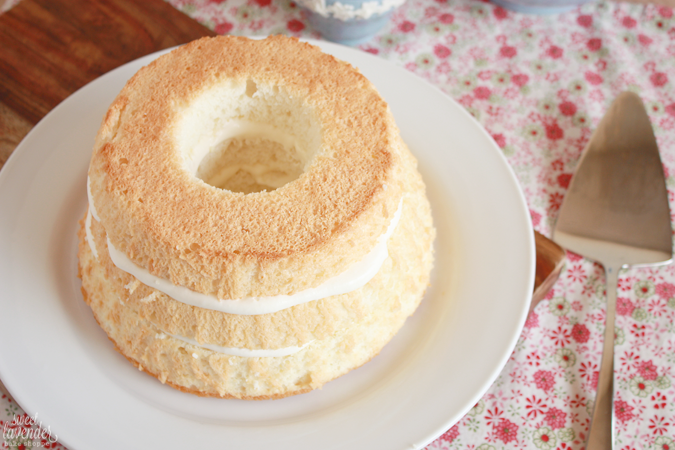 Place widest layer of cake onto a cake plate or platter and generously top with a layer of cream. 3. Place middle layer of cake on top of the cream and spread another layer of cream on top of that. 4. Finally, place smallest layer of cake on top. 5. 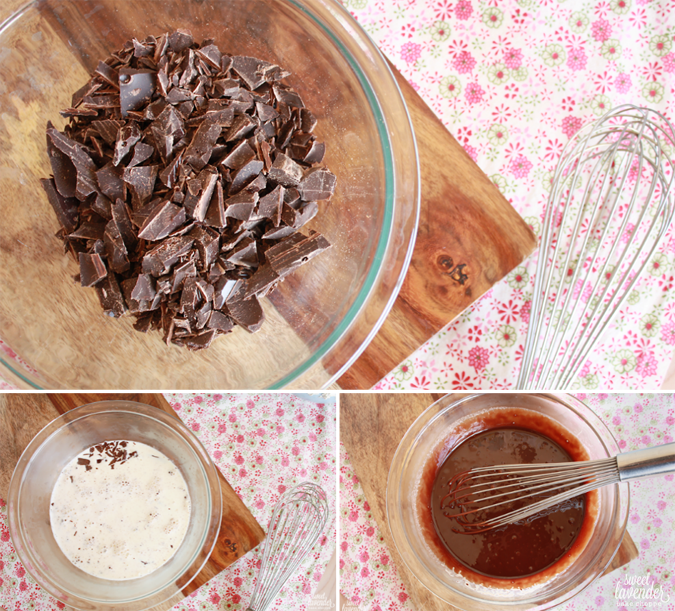 Remove ganache from fridge and give it a whisk. It should have thickened up a tad but still be pourable. If it as chilled too much and is not pourable, you can very gently re-warm it over a double boiler. You want it to be thick like pancake batter. 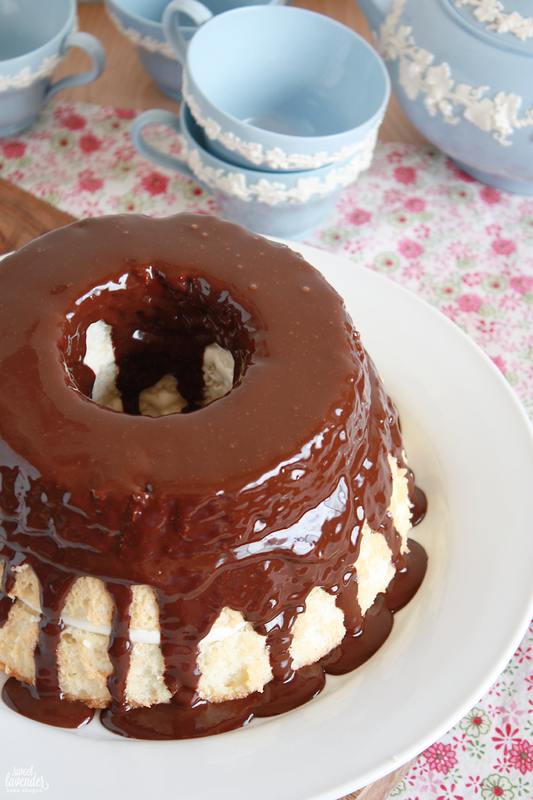 Generously drizzle entire cake with your slightly cooled chocolate ganache. Serve immediately, alongside remaining cream and chocolate (if there is any), for guests to add on top of their slices. 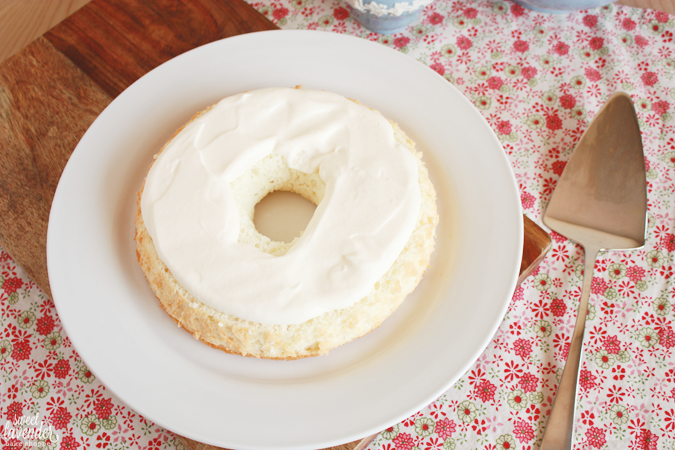 We gave each slice a serious extra dollop of cream. OR you can store cake in the fridge until ready to serve. If storing in fridge, allow to rest on counter for 30 minutes before slicing and serving. Cake should be eaten day it is made. Cream should be made day needed and stored in fridge until needed. Ganache can be stored at room temperature unless storing for more than 4 or so hours. Make sure you gently warm up ganache over a double boiler to make it a pourable consistency, if making sauce ahead of time. This is my father-in-law's favorite cake! I want to try and make it for him!!! Wowweeeyowzeee!! That is a ginormous beauty of cakey creamy chocolaty goodness right there, and yet so far away from me. 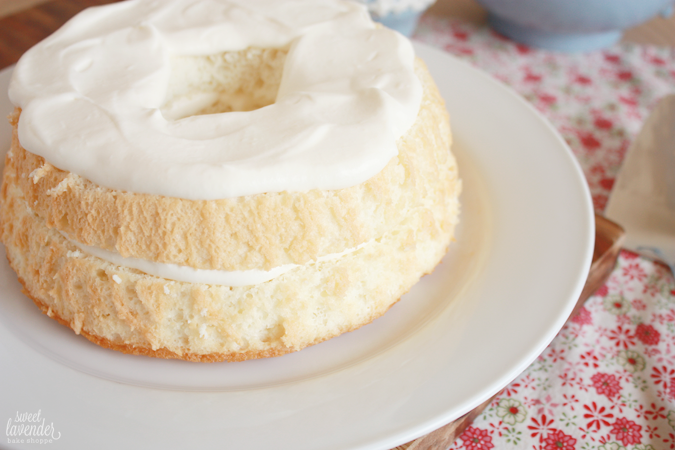 My Mammie used to make me angel food cake every birthday - this definitely steps it up a notch. I'll be putting it on my "to make" list! This looks absolutely delicious! I love boston cream! Oh my word--this looks amazing! Also wanted to let you know I tried the coconut milk beans you posted about..SO good! Oh man, that's so awesome and encouraging! SO honored to hear you tried something and that you liked it. So dang cool.